We are listing the first 2 Marker Types here to start off the contest. Please note the format for the link name. To add a link to this thread click The reply button at the bottom of the page. When you enter your text you click the "http://" button and put the benchmark page address in the box and hit OK. You will then be prompted for a name - enter the PID#, the equal sign, the code number/letter, the equal sign, and the marker type, hit the OK button and you're done. Check the pictures out, the date is visible even in the low light of sunrise on an overcast day. If you need assistance for taking pictures please ask in the other thread about the contest. Please use this thread for entry logs only. PLEASE, do not wait until the last day to log all your entries! PLEASE! (we are old and slow! ). We will try to keep a running tally in our database and will post entry updates occasionally through out the contest. See "The Contest is Afoot" thread. John and Shirley changed the starting date by request to make it easier for us in the Northeast. I better get busy then!!!!!!!!!!! Lets see one stop I can get 7. I should have got that chisled square and stack yesterday I was right there and thought about it but had just completed a HAM Tech test and was plum burnt out. OH well, see ya on the trail. So many benchmarks. So little time! Question. Would it be easier to link to the log, rather than to the bench mark page? That way I could add the required photo to the original log, rather than posting a note. It works better for us to have the link to the benchmark page since we can then check the 'Marker Type' and then scroll down and check the photo. If you go to the benchmark page you will find the option to "Edit Log" which includes adding, more photos. Does SURVERY disk count as a separate type from SURVEY disk? I wanna become a SURVERYOR! Okay, so Harry Dolphin has problems typing! Let's see what I can mangle today! KV4105=54=water tower This is a really great water tower!! Okay. That's what I did this weekend. Three on Manhattan, one in Brooklyn, one in Weehawken and one in Nutley, NJ. Oh, and eight geocvaches. Does this qualify? Or do I have to go back, or find another? I copied your picture and used a photo imaging software and could just make out a date (barely). We accept it as a valid find. GOT TO ADD THE YOUNGEST WITH THE OLDEST BENCHMARK HUNTER. It will be updated as the marks are recovered. You can see all sizes of the images at FLICKR. By clicking on the photo. Geo I think you misread the datasheet. I think your eyeballs were getting a bit heavy and slipped down one line. ME OLD AGE NAH CAN'T BE THAT. How are they looking so far? CV = HE0206 = "MARKER: Z = SEE DESCRIPTION" from the NGS datasheet. Should have looked there first. I went back and looked I still do not see the Z on my end on the original data sheet,I,eye must need glasses. HE0206.an estimated accuracy of +/- 6 seconds. HE0206.and adjusted by the National Geodetic Survey in June 1991. HE0206.The geoid height was determined by GEOID99. HE0206.degrees latitude (g = 980.6199 gals.). HE0206.The modeled gravity was interpolated from observed gravity values. HE0206.Superseded values are not recommended for survey control. HE0206.NGS no longer adjusts projects to the NAD 27 or NGVD 29 datums. HE0206.See file dsdata.txt to determine how the superseded data were derived. HE0206''GULF OF MEXICO 1088 FEET ARE ALSO CUT IN THE STONE STEP. The top line.... From the NGS datasheet, (from the NGS site) not the GC.com edition. Three more feet, and I would have parked on top of this one! Harry- just a quick question. How many tidal stations are in MO? I got a Windmill that's 800 miles west,It is the only one I found. But won't get that way soon enough. That mountian peak is calling, I can hear it now but thats 900 SW miles. But maybe we can get that one and the 2 Country 3 state Boundry Monument. We may have grain elevators out here, but I don't think I'm going to be able to log many of the water based markers, particularly a DOLPHIN, lighthouses, etc. It's not many to the top few, but I'm over halfway (280) towards my goal of finding 520 PIDs this year. I'll definitely break 400, but the contest is so intriguing. 2oldfarts, didn't your mother ever tell you that it isn't polite to challenge a Scorpio dolphin?!? Single-mindedness seems to define them. And this is definitely cutting into my geocaching! We only found one geocache this weekend. mloser: There are many nice things in Newark, even if it is the largest major city with an airport that people fly into and never visit the city. I definitely enjoy the PAC, and the Newark Bears. Actually, I was stereotyping. I had a GREAT Portuguese dinner in the ironbound section a couple of weeks ago. Almost good to travel the 3 1/2 hours back to do it again! Here are a couple of more for the contest. The second is an unknown benchmark in more ways than one. Dolphin run amok. (It's all Shirley's fault!) Weekend in New York, Bergen and Hudson counties. KU3973=52=Standpipe Tank Though how this tower qualifies as a standpipe tank is beyond me. KU4017=83=Flagstaff Now, someone explain to me the difference between a flagstaff and a flagpole. KU3935=63=Stack With windows in it, no less! KU3926=22=Airway Beacon Hard to find in daylight, but it's still there. KU4063=DS=Triangulation Station Disk 6.6 feet from a five hundred foot drop off the Palisades. KV4054=43=Radio/TV Tower Funky looking critter! Is KU3926 a rotating beacon? Tomorrow....who knows what I'll find?! or A Dophin in Search of a Dolphin. The dolphins, unfortunately, are iffier. As Papa-Bear-NYC pointed out, they might look more like nun buoys. So: is they is, or is they isn't? Opinions, please. Final totals for the four day weekend are: 19-21 finds, 14-16 DNFs, close to 200 miles travelled. We invaded two gated communities (hey, we walked through the gates!). One a Russian Hasidic enclave at Seagate, the other a seaside enclave at Breezy Point (one in Brooklyn, the other in Queens). And, we had a lot of fun. Unfortunately, we are running out of interesting benchmarks to search for. Oh, well. 1) It's a fixed navigational aid, mounted on pilings and the description states the mark is the tall center pole. The picture you show, although admittedly it is at a considerable distance, seems to show no pilings and it seems to lean, indication it is floating in the current, not fixed. 2) The Coast Guard's 2005 "Lights List" ( http://www.navcen.uscg.gov/pubs/LightLists/LightLists.htm ), which lists all Aids to Navigation, shows no dolphin in that vicinity. Although I find it hard to read, I searched for "dolphin" and only turned up a couple nearby (off the Manhattan South Ferry terminal), plus a few dozen others at various points along the coast from Maine to Delaware. 3) The map shows it close in to Coney Island, but your picture shows it quite far out in the channel. Topozone shows it about 100 yards off the point ( http://www.topozone.com/map.asp?lat=40.577...=25&datum=WGS84 ). Since it's a horizontal control point, one would assume this is fairly accurate. It may be the perspective but it looks in your picture to be nearer to Staten island than to Brooklyn. As I said, this may just be perspective. Did it seem to you as close as the map shows it to the point? We need someone with nautical experience who could probably say "yes or no" in an instant. Where is the U.S. Power Squadron when we need them? Irregardless of what is at the site for the dolphin, it qualifies as "12=DOLPHIN" since that is how it is listed on the NGS datasheet. If that is where the coordinates say it is, then it meets the requirements. We found Kanab South Cairn and when we checked the NGS we found it is not a "cairn" at all, but a "Stone Monument"! We have seen other benchmarks that are different from what we would consider the marker type. The Marker type was probably decided by whoever did the original field notes/monumentation work and what they thought it was. Is it a spire, steeple, tower, etc? Given the evidence I think it qualifies as Not Found. Papa Bear makes a good case by his description of a dolphin having pilings and being a fixed monument. Even Mr Dolphin himself had some doubts. The only way to really be close to sure would be to take a boat out to the marker and see if it in the location on the description. Even then, it would classify as a Found, Poor in NGS terminology since the mark described is not the mark found, even if it is in the same location. GQ0323''OF ROCK MONUMENT OR WOOD TARGET. What is odd is that there is no mention of the cairn in the descriptions from 1933 and 1953, even though it was obviously there or it would not have been named "cairn". The original 1871 description is lost so the 1933 one has to serve. They may have reestablished the station in 1933 (the measurements, not the monument). Cairns are sometimes pretty tough because they are often not the actual mark, but are simply covers over the mark. Without tearing down the cairn to see what is in the middle it is impossible to tell if it covers the mark or a rattlesnake nest. Benchmark hunting is never a cut and dried thing is it!? There are two points in your note. 1) That if the observed object is at the correct location, it must be the designated object. I would not agree with this. What if the datasheet said "flagpole" and you found a "church steeple"? Surely you would look further and perhaps conclude that you didn't find the mark. 2) That the original reporter may have chosen "dolphin" for want of something better, or from ignorance. 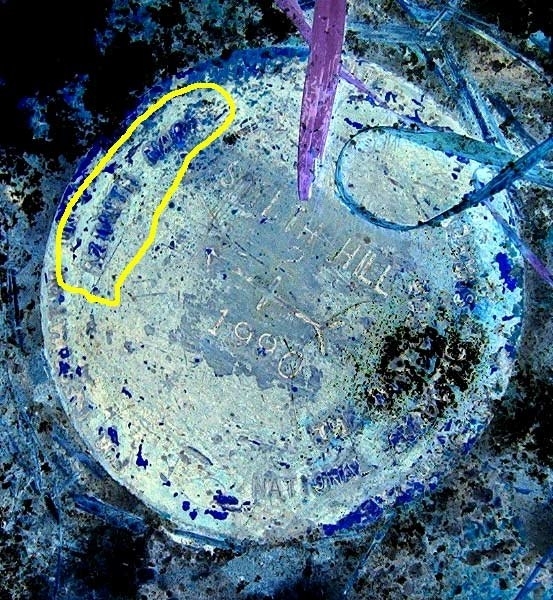 This does not jibe with the description, which not only notes that the object is a dolphin (a particular type of navigational aid) but made a note that the mark was "THE TALL CENTER PILE", an attribute that is specific to a dolphin. DESCRIBED BY COAST AND GEODETIC SURVEY 1945 (RLP) THIS STATION IS THE TALL CENTER PILE OF A DOLPHIN AT NORTON POINT, IN GRAVESEND BAY. IT IS APPROXIMATELY 80 METERS W OF THE ROCK BREAKWATER OF CONEY ISLAND, APPROXIMATELY 190 METERS NW OF CONEY ISLAND LIGHTHOUSE, IN ABOUT 8 FEET OF WATER. IT IS THE MORE S OF TWO DOLPHINS ABOUT 70 METERS APART. THIS IS AN INTERSECTION STATION. 60 years is a long time for something like this to last. Aids to navigation change all the time, that's why the Coast Guard comes out with a new list every year. Listen, I don't want to be a nay-sayer, I want Harry to find a dolphin as much as anyone, but this may not be it. Lesson 1) Never let wishes and hopes taint reality. Lesson 2) Dolphin is the only category available for buoys (?) or whatever they are. The only other option is Z=See Description. I did not observe the buoys moving in the waves. They may well be stationary. The GPS indicated that the coordinates were approximately right. Also, this was high tide, which makes them look further out to sea/bay. Google Earth and Topozone, however, would place the dolphins closer to the breakwater than the objects that I found. These were definitely north of the breakwater. Lesson 3) Most of the benchmarks in NGS are long missing, and NGS knows it. One wonders why there are still listed? As much as the dolphin wanted to find a dolphin, he will admit that they have probably gone to the great fish fest in the sky. These were the only listed dolphins within any close proximity. So, alas, I shall probably never see one. With a broken heart, I withdraw my entry for 12=dolphin. We did, however, find an excellent radar tower, and airport beacon on our trip. Plus a lighthouse (but not for the contest), and a virtual cache at Fort Tilden. And we had a lot of fun. BTW, 2oldfarts has me listed for a 98. I think that should be an X=Chiseled cross. Under the Gilbert & Sullivan theory of "Things are seldom what they seem", what do we think of KV3915, a chiseled triangle that is really a C & GS bronze disk? That 98 was actually a 92-Antenna on a roof. I have the chiseled cross listed in the PID# category, I just didn't get it into the type category. Counting the 12=Dolphin you are at 41 finds. KV3915 was a chiseled triangle until 1933 (?) when someone made a drill hole where the cross was and set the current disk. It is possible but not probable that the triangle is under the disk. Ask Deb for clarification on this one, since I don't think they would want you to "Lift" the disk to check for the chiseled triangle. As for Kanab South Cairn, the actual mark is a chiseled cross under the cairn/Stone monument, but it is still classified as a stone monument. For the contest that is what it would be accepted as and NOT a chiseled cross. If the NGS misnames a marker type we use the "Type" listed on their datasheet. Whether the navigational marker is a Dolphin or just a common buoy, the NGS has classified it as a "Dolphin". Benchmark hunting in the snow. This ain't easy! LY2813=DQ=Calibration Base Line Disk. Unfortunately, the disk is badlly scarred and illegible. So, we went looking 580 meters (that's meters, Harry, not feet) to the sound, and found only the shank. LY2812=DQ=Calibration Base Line Disk. And, remember, the airplanes have the right of way. Oh, well. Next try: LY2896=DZ=Azimuth Mark Disk. Coordinates and descriptiona are right on. Disk is tough to read, and I cannot see 'AZ MK' on the disk, after 'Smiths Hill 2 1990'. So we went on to the Geocaching Event 'Caching Through The Snow Too' at Krogh's Brew Pub in Sparta! That was easy to find. Circled in yellow is "AZIMUTH MA**"
I haven't gotten to the others yet. DV Vertical Control Disc AC8346 J 424 RESET. I've also added it to my log page. KV5336=16=Daybeacon. Coordinates food. Description of location good. Found by NGS in 1984. Might be 20' high, might be higher. What I did not see is a 'round, black, iron target surmounting an iron pipe'. Compare with KV5335. Both were monumented in 1930. Hmm. Comments. KV5331=56=Skeleton Tower. Not quite what I was expecting, but the coordinates are right on. The top of the tower was obscured by the fog. One more trip with failures. Oh, well. I knew I was pushing my luck, and I haven't been able to get back to Queens and Brooklyn for the interesting marks there. So, on the penultimate day of the contest, and the first day of the year, we wandered off to Harmony Township, in rural Warren County, NJ, looking for KV1610=DG= Gravity Station Disk. The road has been widened since 1937. Perhaps the snow cover didn't help, but I can't help thinking this one was lost during road widening. In a desperate fit of naiveté, we considered KV3560=V=Stone Monument, but, we agreed with juanbob that it is definitely on private property (with recent tire tracks in the snow.) Oh, well. We did, however, find a much nicer KV1608=DZ=Azimuth Mark Disk than the previous one that we submitted. (Okay, so the Power Squadron missed the witness post attached to the 'steep grade' sign.) Oh, well. Andy Bear says that Harmony is about as far out into the boonies as he ever wants to go! Happy New Year, all. May all your benchmark hunts be fun. The sun is setting - the contest is now over. You have 48 hours to get your paper work done and post to this thread any finds that you want to submit. We will announce the winner 48 hours from now and they will get to choose between a free year's subscription to Geocaching or a lifetime subscription to GSAK. The list after each name is in the order they found the benchmarks. Let us know what you choice is....Premium membership or GSAK? Good contest and congrats to all!